Setting: I am returning from a trek. A group of locals sitting outside a broken-down tea shack spot me and invite me to join them for a cup of tea. Lady in Red Shawl: Come sit down. Join us. Lady in Red Shawl: Where are you from? Lady in Red Shawl: Oh Chennai Express. Lady in Red Shawl: I’ve seen the movie. Me: It’s actually Tamil Nadu Express. Lady in Red Shawl: What? Me: The Train. It’s actually called Tamil Nadu Express. It goes between Chennai and Delhi. Elderly Man: You came from Delhi? Me: No. I was in Shimla before this. Elderly Man: Have you come here with your wife? Elderly Man: Who did you come with? Me: I came here alone. Elderly Man: You are single? Elderly Man: And you went to Shimla? Elderly Man: Why? These days, most of the tourism is because of honeymooners. Guy with four missing front teeth: Madrasi people are very smart. You must be earning a lot? Me: I am unemployed right now. Guy with four missing front teeth: Why? Me: I wanted to take a break. Travel around. Guy with four missing front teeth: Okay. Is it common for Madrasis to take a break? Is it because your parents are rich? Movies play a critical role in building a mental image of places. They build perspectives and biases. Travel can sometimes break that mindset; many biases that I had about places because of cinema have broken down. Perhaps honeymooners need a tribute here. For making places that were considered inaccessible a few decades ago into commercialized tourist destinations and for eventually making it easy for us single folk to travel to these places. Honeymooners now need to choose new locations and romanticize them enough for Indian cinema to pick it up and feature it in a song. Or is it the other way around? Did cinema give people the notion that romance has to mean snow, mountains, nature, Europe, Himachal (Poor Man’s Europe)? It is very common for people from this part of the world to be extremely comfortable with inserting themselves into your life. Enquiries on your pay, marital status, employment are common. No dances to be danced and no warming up to you to be done. Cinema and travelling – often romanticized individually and sometimes even together, I do not think they get along. It is obvious that no movie can truly give you the experience of travelling, and the reverse is true as well. I would say that they put you in two separate states of mind. There have been instances when I am watching a movie, and I lose complete perception of who I am, where I am, who is sitting next me, my mind, my body and everything. I lose perception of whether I am watching it at home, at the cinema, or at a friend’s place. I am not aware of anything except the movie. Cinema makes me go into a conscious trance. I’m engaging my senses but in a less self-aware state of mind. Travelling, on the other hand, makes me hyper aware. I am trying to soak in everyone and everything very consciously. I actively disengage from taking numerous pictures. Instead, I try to soak in as much of the city with my eyes, ears, nose and tongue. You can say that there is a heightened sense of awareness and perception. In my experience, travel did not give me any reminiscence of movies or cinema. But quite the contrary happened. It broke a lot of stereotypes that I had about places and people because of movies and the media you consume. Your reality is ninety percent of what you perceive. So travelling with an open mind can break those perceptions. There is a lot of beauty in this. I would say there is one similarity between a good movie and travelling. It is their ability to pull you in and engage you with the experience. And yes, both can be addicting. Setting: Ramlal, the cab driver who took me from the train station to the hotel room, looked at me with pity, because I was single. He offered to take me to Kufri Pass at a great discount. Being on a shoestring budget, I gladly took up his offer. He must have been fascinated by the fact that I had never seen snow in my life, in spite of being old enough to grow a beard. 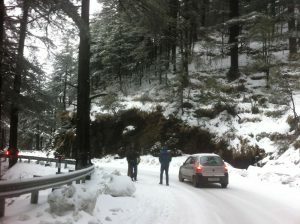 On the uphill drive to Kufri Pass, I spot small mounds of snow lying on the sides of the road. Me: Is that snow? Can we stop? Ramlal: Bhaiya [Brother], the entire mountain will be covered in snow once we go up. You can take pictures there. Ramlal (sensing my disappointment): Okay I’ll stop for a quick two minutes. We get out and he helps me take a few pictures. During the process, I notice that it has gotten severely cold. 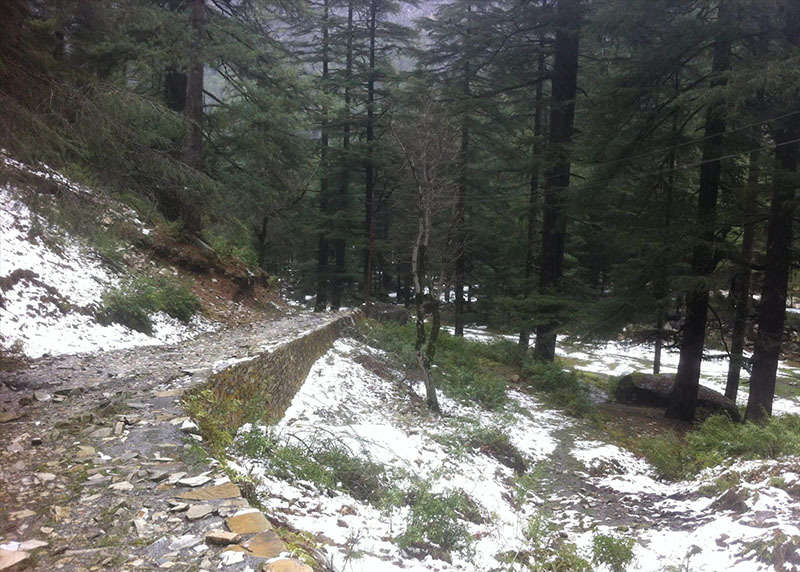 This was late-January in Himachal Pradesh and it was snowing. For someone raised in the blessed humidity of Chennai, while not knowing what humidity meant till he was 17 years old; this was Cold. I felt my bones were freezing. Getting back into the car, I go for the complete gear. I reached into the car for my winter gear: scarves, neck warmers, gloves, sweater, jacket. Ramlal (still only wearing his sweater and half sleeve shirt underneath): It will get colder as we go up. We are just starting now. Me: Oh! I have never been below 17 degrees. Will it snow soon? Ramlal (with an almost worried expression): Looks like it might. On our drive to the pass, it starts snowing. I start wondering how my fascination for snow began. Roja. It has to be Roja. Simla Special added to the fascination, which was reinforced by a generation of Tamil film directors, who had the lead pair dancing in snow, hurling snowballs and declaring eternal love to each other with snow-clad mountains as their witnesses. We reach the peak after driving for an hour. I spend some time up there trying to soak in the view of the majestic snow-covered mountains. But the cold makes me want to crawl back to the warmth of Chennai. I develop a real appreciation for cities on the coast. We start our descent back to the city after spending a couple of hours at the peak. The snow falls fast and heavy now. While I continue to bask in the glow of my still young affair with snow, Ramlal’s face shows worry. Vehicles block the path all the way down. The driver of a water tanker parks on the side and empties the load so that maneuvering becomes easier. An old Maruti 800 struggles to grip the icy road and skids, stops and skids again, coming to a halt with a crash on the divider. Ramlal: We might have to park on the side of the road and walk downhill. Me: Oh. No hurry. We can go slow. 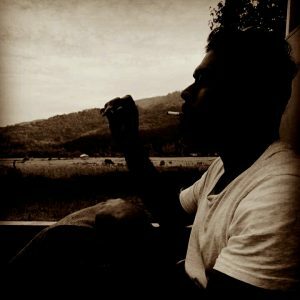 Ramlal: No Sir. The car won’t grip the icy road. The snow has to be cleared. Me: My first day in snow is turning out to be an adventure! Ramlal: I am actually scared now. I have been driving these hills for sixteen years and my legs are trembling in fear. Maybe Ramlal wanted me to be more serious. But one man’s pleasure is another man’s anguish. Despite my best efforts, I wasn’t as scared as him. I was restless, I wanted to jump out and dive into the snow. Ramlal’s fear stopped me. He started narrating frightening stories of families being stranded on the pass in snow. His stories of harrowing experiences were my adventure aspirations. The more we waited on the hill, the more restless Ramlal go, and the more frightening his stories became. The traffic started to ease. Vehicles started moving. The journey downhill gave Ramlal’s face the same expressions that he had going up the hill. Confusion, excitement, relief. In another twenty minutes, the roads started to clear. The snowing stopped, and the rest of the journey downhill was uneventful. We made our way into the city. Ramlal still looked vaguely uncomfortable. Ramlal: Actually, can I stop the car for 2 minutes? I had a fair idea why Ramlal wanted to make a quick stop. As luck would have it, we halted at a bridge that overlooked snow-covered mountains on either side. It was a stunning view. Getting out of the car, crouched and bent over, Ramlal found privacy behind a tree. I was snapped out of my reverie, my wind wandered to other territories. Territories where the bliss that Ramlal experienced relieving himself after holding it in for the longest time, outdid the perceived bliss I felt sitting between two snow-capped mountains. “Profound… maybe?” I said to myself. K leads dual lives. Unhealthy amount of daydreaming. Monologues to an audience of one; usually self. Getting lost in an abyss of rambling and rants. Self diagnosed man-child and non-conformist.